It comes as no surprise that many sailing enthusiast are increasingly moving away from boats and are now buying inflatable kayaks. Kayaks are easier to transport, require less storage space, and some models have excellent performance that rival even those of hard shell boats. To top all that up, kayaks can be used for a wide range of functions including fishing, exercising, exploring, and even to have fun splashing about on water. But how does one go about buying his or her very first kayak? In order to answer that, this inflatable kayak buying guide will give you some helpful pointers to guide you in the right direction. One of the key considerations to make when shopping for an inflatable kayak is the goal you hope to get out of this enjoyable sport. Kayaks come in a whole range of types, all of which offer the option of a single paddler, 2 paddlers, or in some cases, a small third passenger. Understanding the different options available will allow you to choose a kayak that’s ideal for where you plan on paddling, how long you intend to paddle, and the conditions you’ll be paddling in. Everything about fishing kayaks has been designed to help anglers in their endeavors. These kayaks come with rod holders, bait buckets, cooler holders, and built-in boxes for storing fishing equipment. Additionally, fishing kayaks have a rounded top and bottom, allowing them to remain steady when in use. Thanks to this special design, touring kayaks will increase lift in waves and rough water, shielding a paddler from the impact of rough waters. Most touring kayaks have rudders for easier steering and bulkheads with sealed hatches for enhanced safety. As the name suggests, touring kayaks are made for the sole purpose of exploring exotic locations that are only accessible via water. These kayaks feature thin and long designs that enable kayakers to travel for long distances in both still and rough waters. Recreational kayaks are affordable, easy to use, and perfect for beginner kayakers thanks to their wide body feature, which enables them to provide paddlers with plenty of stability. However, these kayaks can only be used in calm rivers, ponds, or lakes, as they don’t perform in open waters, rough waters, or areas with strong wind. 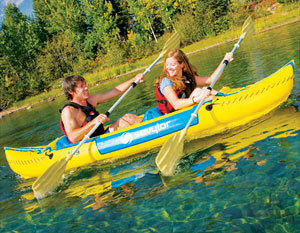 Short and wide, whitewater kayaks are ideal for rough waters and high currents. Thanks to their length, they’re easily pushed by the water’s current and are easy to maneuver around rocks and other obstacles. The width of a whitewater kayak further provides you with stability while you’re battling it out in the water. Instead of a cockpit seat, sit-on top kayaks have a molded depression on top of the vessel for sitting, and hence the name. The molded depression seat, coupled with the width, make the kayak ideal for recreational purposes during warm weather. Kayaks feature different hull shapes, weights, cockpit designs, and seating options. So, always check out the specifications of a certain kayak to ensure it meets all your needs before making a purchase. A kayak’s dimension is an important factor to consider as it will determine how comfortable you’ll be while out in the water and how well the kayak will suit its intended purpose. Kayaks come in four main dimensions: short, long, wide, and narrow. Short kayaks are suitable for beginners since they’re easy to maneuver, while long kayaks can travel in a straight line with ease and are therefore ideal for long distances. Finally, wider kayaks offer more stability while narrow ones are ideal for experienced kayakers. Although not needed in the steering of a kayak, a life vest and helmet will work to keep you safe when you accidentally fall off your kayak into waters that come with currents strong enough to sweep you onto hard rocks and out into open, dangerous waters against your will. Trying to swim against such currents or even stay afloat against them will tire you out before you know it. Therefore, be sure to always buy a life vest and helmet, and don’t just leave them on the kayak for beauty purposes – wear your life vest and helmet at all times! Kayaks and paddles go hand-in-hand since paddles are needed for steering purposes. Paddles also come in a variety of sizes, so go for one that you can comfortably use. Inflatable kayaks require a delivery of low-pressure air when inflated. Although most kayaks can be inflated with just about any type of air pump, make sure to check package details of your vessel in case there are specifications on the ideal pump to use. Although often overlooked, a repair kit is a lifesaver accessory that all paddlers should have. Some kayaks come with their own repair kit while others don’t. Sometimes, you can get a very good repair kit for a very reasonable price too. Be sure to keep an eye out for such packages when they appear. Finding the right inflatable kayak for you can be challenging. However, if you heed this inflatable kayak buying guide and do some research beforehand, you’ll definitely be successful in your search.